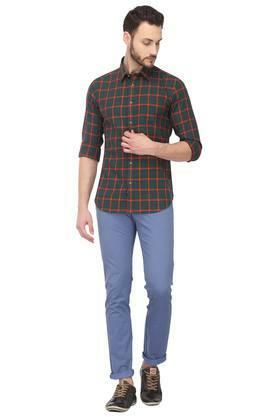 Try this pair of trousers from the house of Allen Solly that will impress any fashion connoisseur. Crafted from superior quality fabric, it will be an ideal option for you as it promises to provide you with unmatched comfort throughout the day. Moreover, it has four pockets, which add to the design. Buss the cloud of fashion trends by wearing this splendidly crafted pair of trousers, which comes with a print pattern. It can be matched with contrasting shirts and lace up shoes for several occasions.